Olive Chancellor: Don't you believe in the coming of a better day? That it's possible to do something for the human race?" Basil Ransom: What strikes me most, Miss Olive, is that the human race just has to bear its troubles. Olive: Why, that's what men say to keep women in the position they made for them. Basil: The position of women is nothing but to make fools of men. Ismail Merchant and James Ivory would bring their second Henry James adaptation to the screen with The Bostonians. First published in 1886, it was one of the first American novels to deal even abstractly with lesbianism, based on the 1883 character study on religious fanaticism, L'Évangéliste, by French author, Alphonse Daudet. Like Merchant Ivory's first James adaptation, The Europeans, The Bostonians was originally developed as a made for public TV feature, this time, as one of a five part WGBH special on the James family, however, due to cutbacks at the National Endowment for the Humanities, the project fell through, but with Ruth Prawar Jhabvala's script already written, the film was produced instead for theatrical release. While still modest by today's standards, the larger, $2 million budget allowed for the casting of the film's two established leads—Christopher Reeve, still best known for his recurring role as Superman, and veteran Vanessa Redgrave (Isadora, Camelot), who would earn a well deserved Oscar nomination for best actress for her performance. Set in post-Civil War Boston, the story centers around Verena Tarrant (Madeleine Potter), an articulate, outspoken young woman who becomes the object of a power struggle between the two people looking to dominate her—Basil Ransom (Reeve), a chauvenist southern lawyer vying to domesticate the girl at the expense of her feminist passions, and his cousin, Olive Chancellor (Redgrave), the woman who wishes to use Verena's natural skills as an orator to ignite the growing suffragette movement. Verena, the daughter of a faith healer, is torn between her love for both of them. As Verena's popularity grows on the lecture circuit, Olive, a closet lesbian, goes to every end to deflect the many attentions Verena solicits, but is unable to thwart Ransome's charm. Verena is left to choose her fate, with neither of her options providing an ideal. The period detail and exquisite cinematography Merchant Ivory fans expect is present in abundance, with gorgeous sets and costuming. Despite its many dramatic moments, The Bostonians is somewhat stilted in its execution. As the immediate precurser to their breakthrough A Room with a View, what is perhaps most interesting about the film is the continuing development of the team's strengths in handling emotional subtlety. Since James' writing, by its nature, relies heavily on internal conflict, it is often the unspoken undercurrent that holds the most interest. While none of the characters are particularly likeable, Reeve and Redgrave offer brilliant performances, continually trying to undermine each other's influences. However, their star presence often overshadows Potter's central character, rendering her less effective as a key player, and weakening the film's overall impact. Wesley Addy, the patriarch of The Europeans, returns as Verena's father, Jessica Tandy (Fried Green Tomatoes) turns in a wonderful supporting role as Mrs. Birdseye, and the cast is rounded out by such noteable talent as Linda Hunt (The Year of Living Dangerously) as Dr. Prance, and Wallace Shawn as newsman Mr. Pardon. The adaptation is not entirely true to the original story, being more sympathetic to the feminist movement and particularly Olive's character, whose sexuality is more obvious, but does not become a central theme. Jhabvala also took liberties with the film's ending in an apparent effort to update the story with more contemporary ideals, and although Redgrave handles the part well, the result feels a little too contrived. Even though it doesn't stand on the same ground as their masterworks, A Room with a View, Howard's End or The Remains of the Day, The Bostonians delivers some superb performances along with the kind of artistic air only Merchant Ivory can muster. Image Transfer Review: The Bostonians is presented in a new 1.78:1 anamorphic transfer. Colors are defined and earthy, though occasionally a little murky, and the source print has some minor imperfections, and is a little soft in places. Detail is very good overall, and the picture maintains a filmlike quality, with moderate but natural-looking grain. Audio Transfer Review: The English stereo soundtrack is free of any major defects. Dialogue is for the most part easy to discern, however some of the more dynamic sections are a little more obscured. The film is augmented by Richard Robbins' unobtrusive score. Extras Review: The primary extra is another installment in the Conversations with the Filmmakers series (15m:02s) that are found on other titles in the Merchant Ivory Collection. Director James Ivory, producer Ismail Merchant, and screenwriter Ruth Prawer Jhabvala discuss the genesis of the project, the issues behind the adaptaion, and the choice of actors to fill the roles. Trailers for the feature plus The Europeans and Heat and Dust are also included. The insert contains technical details and an essay on the film by author Robert Emmet Long. 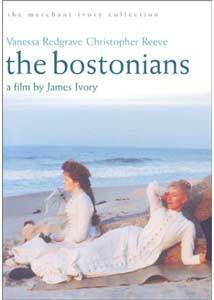 Beautifully shot and driven by exceptional performances by Christopher Reeve and Vanessa Redgrave, The Bostonians delivers the kind of period film that Merchant Ivory fans expect, and while not mustering the exquisiteness of their greater works, deserves an audience. Recommended.